If you’re not yet familiar with Rod Millen’s Leadfoot Festival, you really ought be. In the same vein as Goodwood’s Festival of Speed hillclimb, Rod Millen has crafted his own hillclimb in New Zealand on his own property, which he lovingly refers to as ‘Leadfoot Ranch’. 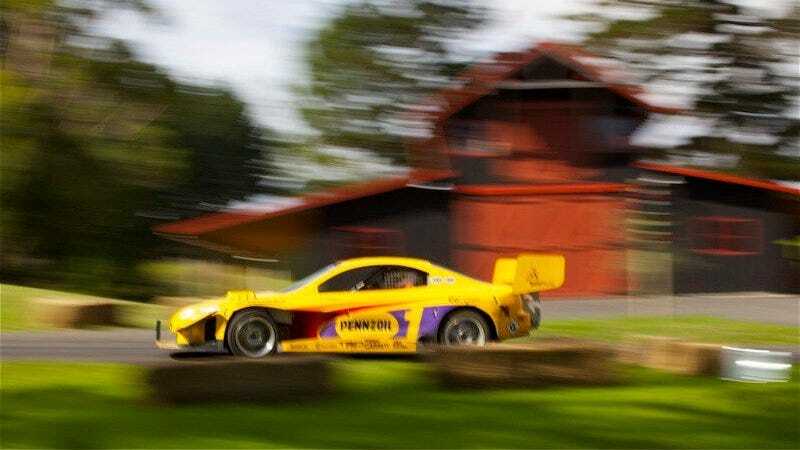 Acting as the event’s own headliner, Rod trotted out his Pikes Peak International Hillclimb record-winning Toyota Celica of 1994 for last year’s event, and it was a smash hit. Only a fool wouldn’t bring a bazooka to a knife fight in his own back yard, right? And Rod Millen is no fool. The video below was shot at 2017's Leadfoot Festival, and released just in time to promote 2018's high-octane hillclimb taking place February 3rd and 4th. The video itself is limited to 720p, apparently shot on a PotatoCam 5000, but the sound alone is worth the click. Millen’s sort-of-looks-like-a-Toyota-Celica monster machine makes somewhere around 880 horsepower from a giant turbocharger, a race engine Toyota tried to pass off as based on the production 3S-GTE, and likely a bit of magic. The fact that this car is still running up mountains twenty-four years after it crushed the PPIHC record is astonishing. Most manufacturers would lock up their historically significant cars in a museum vault somewhere.